A Guide on the Little Bits and Bops of Your Grow-Op. To keep your beautiful plants happy and healthy in your indoor grow, you’ll need to do a few things. First, ensure their soil is moist at all times. Allow your plants to take in oxygen, as more oxygen helps your plants grow faster and feeds them the right nutrients. Lastly, check their PH levels, and adjust accordingly. Your choice of pot will affect all of these factors. 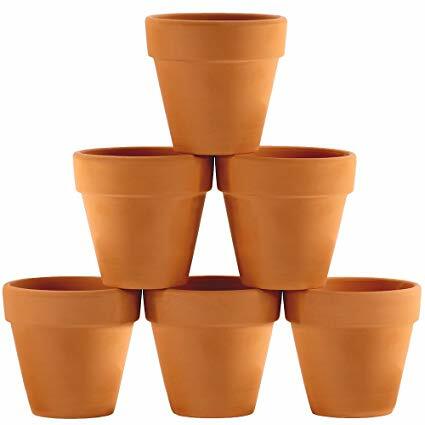 When choosing the pots to grow your pot, it’s important to consider the context of your grow. You want to give your cannabis the best root growth and structure you can, so picking pots that can help with this is important. You can use many different types of containers for your cannabis; these are just a few suggestions, which are generally the common pots used for this purpose. Standard plant containers. These are typically made of clay. They are easy to find at any gardening store, or at Bunnings. The biggest issue with these pots is that they’re a bit heavy. When moving around your plants, it’s nice when they aren’t too much of a strain. These pots do retain water really well, though. 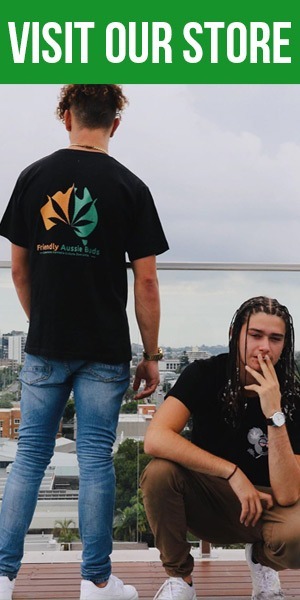 This could be a positive or negative, depending on your grow. Air Pots. These are made from plastic, but have holes all over the sides to allow for more oxygen and faster drainage. They’re also very cheap, and easily purchased on E-bay. They come flatpacked, meaning you assemble them yourself. Personally, I love these. You can use the holes to help train your plants. They drain very easily, though; as a result, you’ll likely need to water your plants more often. On the upside, it’s harder to overwater your plants! Fabric/Smart Pots. These pots are similar to Air Pots. They allow for more oxygen to get to the roots, because they are made of fabric. They also allows for better drainage. These pots do dry out quicker than clay pots, but they’re super cheap, very effective, and easily purchased online for cheap on eBay. Buckets. This is where you just take a bucket and put some holes in the bottom for drainage. A bucket will help you hold onto water longer than Air and Smart Pots. They’re like a clay pot, but are much cheaper. 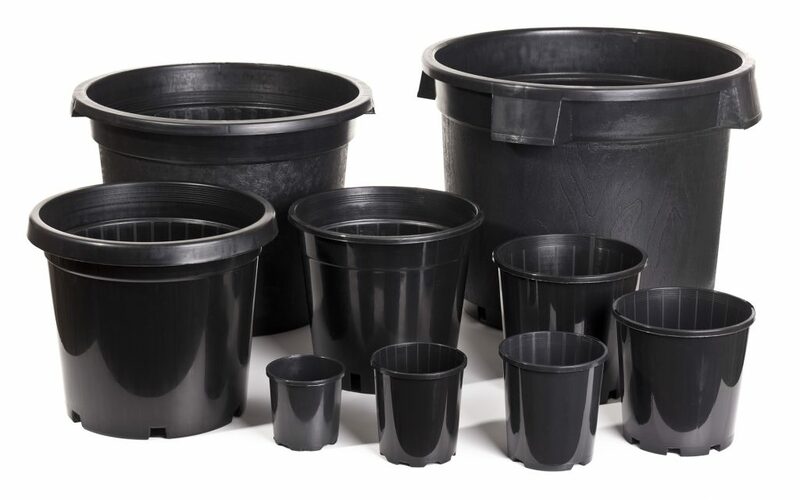 If you’re growing large plants, buckets can be a great choice! Hydroponic Containers. 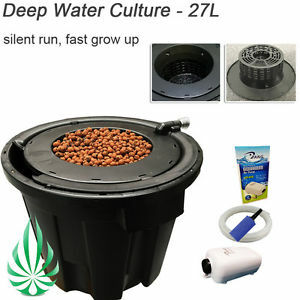 If you’re considering a hydro grow with a water pump and a reservoir of water, you’ll be looking for hydro containers. This is where your cannabis will sit in water. Typically, you use baskets similar to these with clay balls as the soil medium. We don’t recommend this for beginners. When picking your pots, you also need to be looking for a saucer or tray for your pots to sit on top of. Sitting on top of the saucers will allow the water to build up on the saucer, rather than the floor. 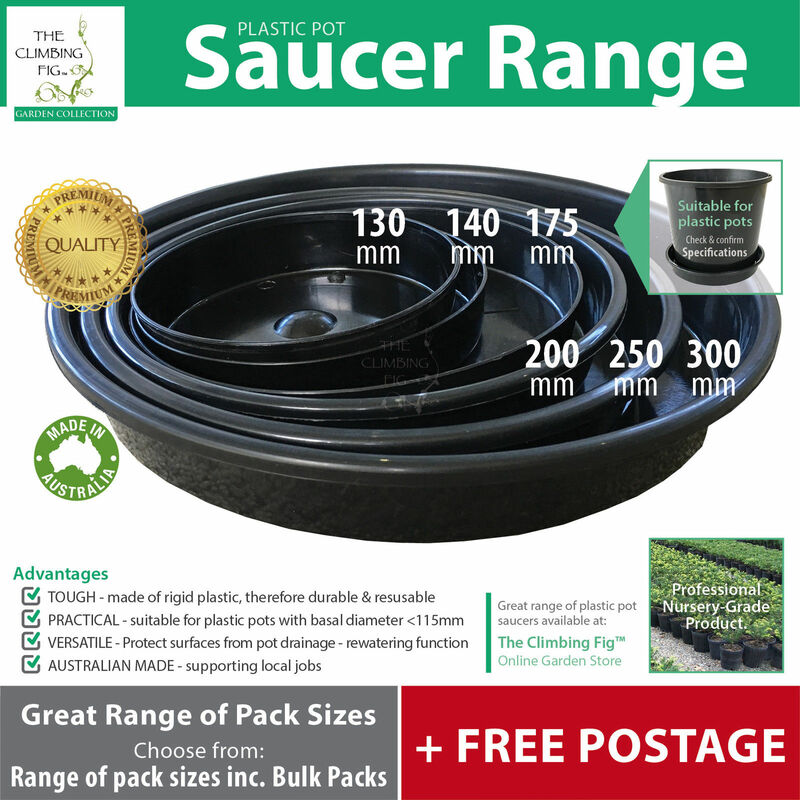 You can find saucers in Bunnings or on E-bay. When picking a saucer or tray, all you really have to do is find one that is slightly bigger than your pot. So if your pot is 25cm in diameter, find a saucer that’s a bit over that – 30cm. This is important when deciding how many plants you’ll be growing, as you need to attribute this size to your grow tent’s size to make sure all the pots fit! It doesn’t matter too much if they’re made from plastic or clay – just as long as you have them. The size of your containers will depend entirely on how big you want your plants to get, as well as the size of your grow tent. Ideally, you want to figure out the most amount of surface area you can cover with your pots in your grow tent. So, if your grow tent is 1 x 1 metres, you could potentially hold nine 30cm diameter pots, in a 3×3 grid. This gives the plants a little wiggle room from each other… but you could also look at just doing 4 plants in 40-45cm diameter pots. Typically, your yield isn’t factored by how many plants you have, but the area in which they grow. So having 4 bigger plants can be easier to manage than 9 smaller plants. This is a decision that’s up to you, however. For a beginner I would recommend bigger plants in bigger pots. The general rule of thumb to follow is per 30cm of plant height, provide 8 litres of soil. 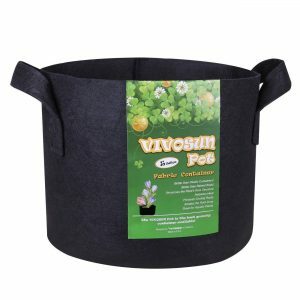 So if you want 1-metre-tall plants (depending on your grow tent again), you would likely want 24 litre pots. 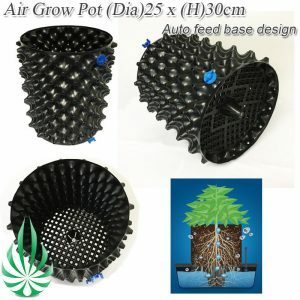 But if you’re growing in coco coir – which is what we recommend – you could grow 1 metre tall plants in 13-15 litre air pots without much worry. You’ll just have to water more regularly. 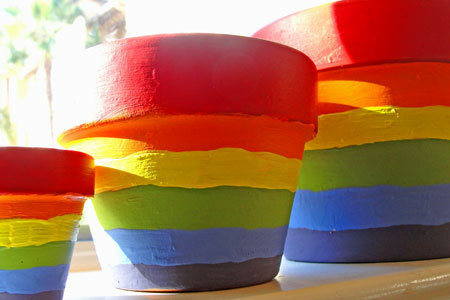 Basically, pick larger pots where you can, as pot size determines how big your plants can get. Well, first thing’s first. You need a water can! You can pick one up in Bunnings, of course. I recommend grabbing at least a 9 litre watering can. Not too big, but not too small; your plants need a lot of water! Next, you need to know about how to feed your plants nutrients through the water. Read our nutrient guide for more. And now, the most important part of watering. Checking and adjusting for pH to allow your plants to absorb nutrients most optimally. Cannabis plants thrive best in water that is between 5.5-6.5 pH, growing in coco-coir. For growing hydroponics, I would suggest aiming for a pH of around 6.0. If growing in soil plants, best to work at around 6.0-7.0 – a pH of around 6.5 will make your life very easy. Remember, though; you don’t need to be exact. Just keep your pH within range. How do you check and adjust pH? It’s quite simple. You’ll need to purchase a pH metre. You can pick one up on eBay for just $15 with free shipping. To use the metre, you need put it into your watering can to see what number it reads out. Pretty simple! You can also pick up a soil metre in order to check your soils pH on eBay for around $30. This is good when you’re growing in traditional soil, as opposed to coco-coir. 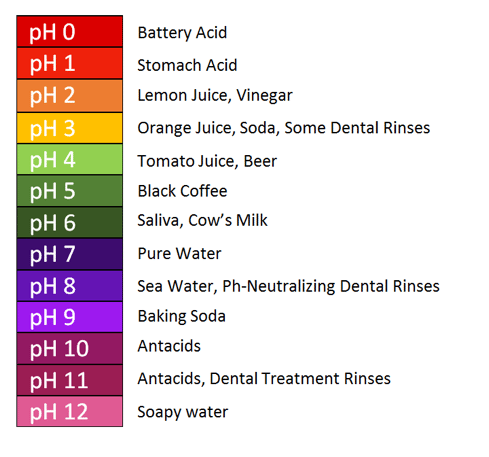 To adjust your pH, you need to purchase some PH down and pH up. (Realistically you only need one of these once you know what the pH of your water supply is. You can grab them on eBay for $25 with free shipping. Now you’ve got the tools. How do you use them? Add your nutrients and/or supplements to your water, then give them a mix. It can help to put your nutrients into a small cup of water, then mix it around in the cup and put the cup in your watering can. Give it a good stir. Now, test your pH. Is it on point? If not, it’s time to adjust your pH by adding pH up or down, depending which way you need to go to get back within range. Follow the directions on the bottles to figure out how much of the solution to add to your water. Once you have completed this step, retest your pH level and make sure it’s within the proper range, if not, keep adjusting. Now, water your plants! It’s important when watering your plants to allow for 20% runoff outside of the pot. With the runoff, test the water for its pH. If it’s not within what you require, you’ll need to adjust your pH again. If your plants are very young, you won’t need 20% runoff, as their roots haven’t grown enough yet. Once you figure out how much pH up/down you need to use to adjust your water, it’ll likely be the same amount every time, assuming it’s from the same water source. Nutrients: Don’t use too much. Using less is better, as you can always add but never take away. Start with a half dose strength of nutrients, and work your way up. Never mix nutrients directly with each other. Always add them into water. Add “micro” nutrient to water first, if you’re using a 3 part nutrient solution. Read the instructions on your nutrients for more information. pH can always change. As long as you’re within the guidelines, though, you’ll be fine. You can learn more about adjusting your pH on Grow Weed Easy. 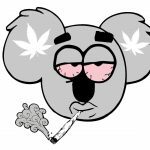 An excellent resource for growing cannabis.